At the beginning of 1916 the British aircraft manufacturer Sopwith produced a very successful single-seat fighter, enshrined in the history of aviation with the short and succinct name of Pup. This type quickly became a favorite mount of British pilots and was built in sizeable numbers for a while. When an aircraft was first introduced into front line squadrons, one of the main criteria of its fighting ability was not only speed, but also maneuverability - it was of crucial importance in dog fight conditions when large groups of British and German pilots faced each other in the air. 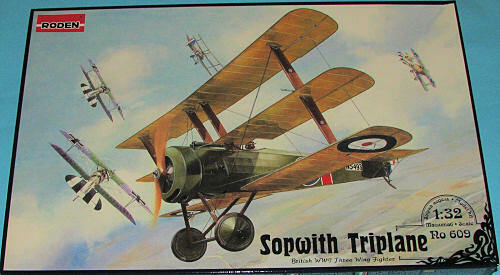 Biplanes were obviously much more maneuverable in comparison with clumsy monoplanes, and were normally preferred, but in their constant effort to improve every important aspect of maneuverability, the designers of the Sopwith Company decided to risk fitting an additional third wing to the well designed and combat tested Pup. Multiplanes were not unknown, even before the war; however they were isolated and experimental designs. Now the intention was to put such an aircraft into production, one which could compete on equal terms with the latest developments of the enemy. At first, the construction of the Pup's fuselage was to be unchanged, but the firm's chief engineer Herbert Smith decided to modify it. The new development with three wings inherited from the Pup only its horizontal and vertical tail assembly. Its wings had an unusually low chord in comparison with the Pup (which would improve the pilot's view from the cockpit), and ailerons on each of the three wings. A powerful Clerget 9Z engine of 110 hp was fitted to the plane, which was changed once production was underway for a Clerget 9B of 130 hp. The armament of the fighter consisted of a single synchronized Vickers machine gun (but at least six machines later boasted two machine guns). At a later stage of production the tailplane of the aircraft was given a new form and it now little resembled its predecessor. The first test flight of the new aircraft was in May 1916. The results were simply spectacular, especially as regards its maneuverability and rate of climb. The Sopwith Triplane (as the fighter was now known) was immediately sent to undergo military trials in France, and later the second pre-production machine was sent to the front. The tests continued until the end of 1916, and as a result the RNAS as well as the RFC were interested in the type, however the RFC later rejected the triplanes in favor of the newly delivered Spad S.7. In April 1917, forever remembered as "Bloody April", six RNAS squadrons received Sopwith Triplanes. The first serious clash with the latest German fighter of that period, the Albatros D.III, led to astonishment amongst the German military: the new English triplane surpassed their own development in all respects, even speed. During one sortie two triplanes suddenly encountered a large German Albatros formation and knocked down at least three of them in a few minutes while the surviving enemy machines left the area immediately. Thus was born the legend of "the unsurpassed English design with three wings" which greatly influenced the Germans and encouraged Anthony Fokker to design his famous Fokker Dreidecker, his "response of the Germans to the British". In that period more than 100 Sopwith Triplanes were built and the majority of them were delivered to RNAS squadrons on the Western Front. Seventeen aircraft were delivered to the French Aviation Maritime. At least one machine was sent to the south, to Macedonia, where it was used as a patrol machine over the Aegean coast. Another aircraft, N5486, was sent to Russia in the spring of 1917, where ski gear was fitted to it and it was extensively used in the subsequent intense period. The combat career of the aircraft appeared to be brief, but not because of its capabilities. The main problem with the Sopwith Triplane was the very long period of time required to repair machines after combat damage. Its construction was more complex than the conventional biplane, repairs in the field were often impossible, and sending each of the damaged machines back to repair depots in Britain from France was very expensive for the military. The final straw in the fate of the Triplane was the Sopwith Camel, whose arrival immediately pushed almost all previous British fighter aircraft into the background. In the middle of 1917 at least 18 active Sopwith Triplanes were at the Western Front, but by November 1917 they had all been exchanged for more modern types. 150 aircraft of this type were built, a very small amount even in comparison with the Sopwith Pup (more than 1,700 machines), but the Sopwith Triplane and its German counterpart wrote a very remarkable chapter in the history of the air battles of WWI. It was the era of experimentation and innovation, which were often on the border between common sense and foolhardiness. Only combat use of an aircraft type could prove whether some conceptual development might have a future. The appearance of the triplanes led to a multiplane "fever" - designers began to conceive of machines with four and even five wings. Later, with the appearance of more powerful engines and the introduction of new materials in aircraft construction, all of these experiments became anachronistic, but at least two multiplanes, the Sopwith Triplane and the Fokker Dreidecker, can confidently be called truly successful and classic designs of their era. Roden continues to provide the modeler with WWI aircraft in 1/32 and the Triplane is one that has been much awaited. Molded in Roden's usual grey plastic, the level of detail is superb, as anyone who has built one of their large scale WWI planes can attest. Thanks to the large size of the parts and the general dearth of fiddly bits in planes of this period, construction should move along rather sprightly. Of the six sprues, one for various struts and wheels is duplicated. The engine is nicely molded with separate cylinder heads. A well molded intake and pushrod piece add to the detail level. There are optional propellers; one with squared off tips. The only other option I can see is between a one and two gun armament, with separate upper forward fuselage sections. The fabric effect on all the various surfaces is properly subdued and looks very realistic. Sopwith Triplane N5493, No.8 (N) Sqn RNAS, St. Elois, France, Western Front, flown by Capt. Robert A Little, Summer 1917. Sopwith Triplane N533/C, "Black Maria", No.10 (N) Sqn RNAS, Drogland, France, Western Front, flown by Lt. Col. Raymond Collishaw, leader of the "Black Flight", July 1917. Sopwith Triplane N5382 "The Ooslumburd", Home Defence, Manston War Flight, Kent, July 1917. Sopwith Triplane N5384 "White 9", French Naval Service F.11/SP.9,Western Front, France, Dunkerque, flown by S/Lt Charles Delesalle, February 1917. Sopwith Triplane N5486 ShK1 from the Moscow Aviation School. This a/c was attached to the Special Aviation Group (AGON), used for fight with General's Mamontov Cavalry. Russian Civil War, Southern Front, Zhdanka r/w station, flown by Red Military Pilot Jury Bratolyuboff, August-September 1919. The decals are very nicely printed and one would hope that Roden has managed to overcome their past reputation regarding decals, but one never knows. All painting references are with Model Master paints and generic color names are also provided. This is another beauty from Roden. I can see this being a very popular kit so get yours while the opportunity presents itself. 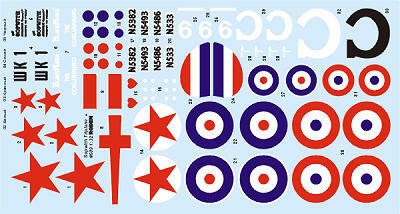 My thanks to Squadron Products for the preview kit. You can find yours at your local shop or on-line retailer.